The CM announced increase for implementing works of MLA priorities under NABARD through Rural Infrastructure Development Fund (RIDF). MLAs priority meeting Shimla, Sirmour and Solan. Rs 7,100 crore state plan size has been proposed for the financial year 2019-20 in Himachal Pradesh which is Rs 800 crore more than 2018-19 with 13 per cent increase. 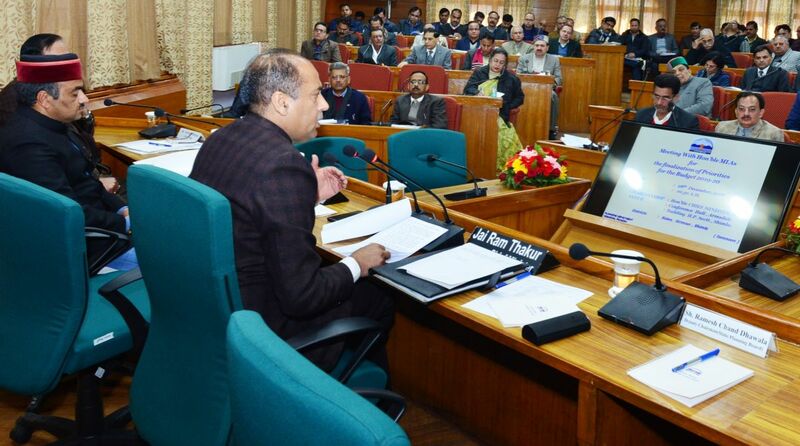 This was revealed by Chief Minister Jai Ram Thakur while presiding over the meetings of MLAs of Solan, Sirmaur and Shimla districts for finalisation of their priorities for next financial year. The projects worth Rs 544.21 crore have been cleared by the NABARD which are recommended under MLAs priorities during the year 2018-19. Thakur said the government has succeeded in getting Rs 9,689 crore six major external aided projects from Central government under tourism development, horticulture development, mushroom development and other such developmental projects. This would go a long way in ameliorating the income of the farmers, horticulturists and providing employment to the youth, he added. He thanked the Union government for providing liberal financial assistance to the state for accelerating the pace of development. He said that the government has adopted ‘Swarnim Himachal Drishtipatra-2017’ of Bhartiya Janta Party as Policy document was ensuring welfare of all sections of the society with a motto of ‘Sabka Saath Sabka Vikas’. The government has launched ‘Jan Manch’ to redress the grievances of the people nearer to their homes. This is helping in saving their time and money besides avoiding unnecessary harassment for getting their problems solved. He said that schemes of present state government such as Jan Manch, Himachal Grihini Suvidha Yojna and Mukhya Mantri Swablamban Yojna etc have proved boon to the people and tangible results were coming out from these. The Chief Minister said that progress of development schemes of different departments were being reviewed and monitored online so that projects could be completed within stipulated period of time besides maintaining quality of works. In addition, citizen-centric services were being provided online to the seekers to bring transparency in the administration.